Please refer to our stock # TBD00221 when inquiring. 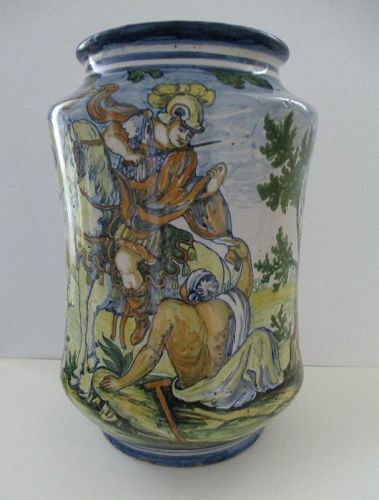 A larger than usual maiolica dry jug jar painted on the front with the scene of Saint Martin dividing his cloak with a beggar. On the back is the cypher for the Carthusian order and the date 1700. Unfortunately it is highly unlikely that this is the date of manufacture for the jar, which is almost certainly from the late 19th century and is loosely based on the series of jars that were made from 1697 into the early 18th century. If I/m wrong and the date is the time of manufacture then at the price this is a great bargain. If one looks at sales results for jars that are regarded as of the period, the difference between them and this one are enough to make it unlikely that this jar is of the same group. 11 7/8 inches (30 cm) tall and 8 inches (20 cm) diameter. Condition; excellent except for a minor chip on the inside of the foot. The rim has some roughness that is mostly from the firing. Furstenberg porcelain cup and saucer early 19th century 12 star pieced cotton quilt American late 19th century Pair Chinese blanc-de-chine porcelain pigeons. 19th century.